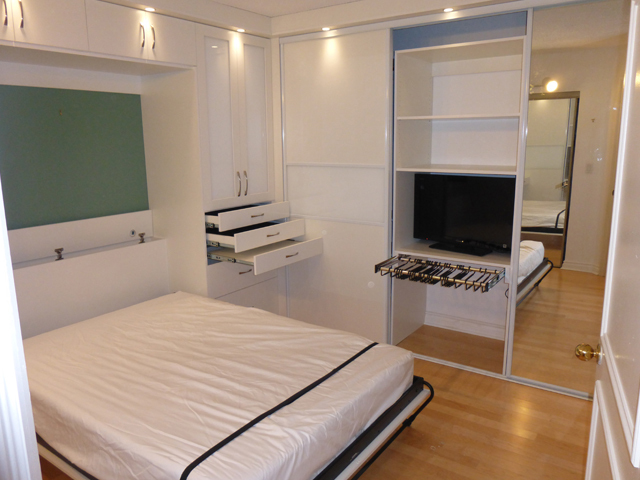 A Murphy bed by Komandor offers flexible usage solutions to under utilized space in your home. 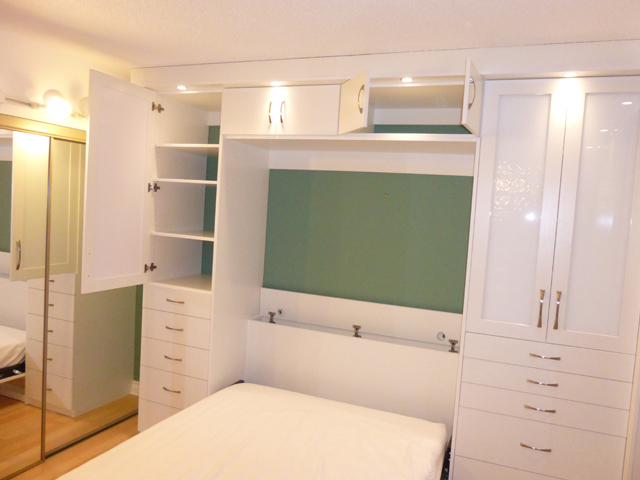 In this project, our client wanted to turn a spare room in their condo into a mixed use space. 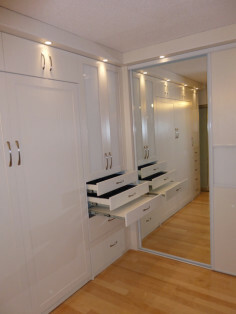 The room now contains a double size murphy bed with custom built-in cabinetry on one wall and sliding doors conceal a closet organizer along another. 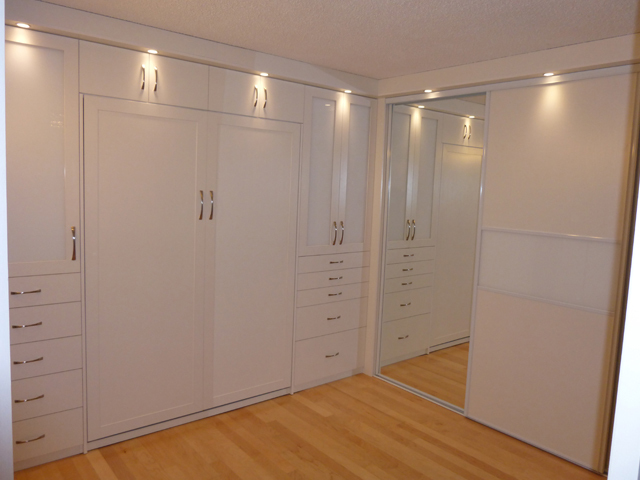 The client chose Komandor’s Aspen White panel finish to accent their wall colour and mixed the white panel with white back painted glass in the cabinet and sliding doors to personalize the design. With this configuration, the client is able to provide a bed and storage to their overnight guests. At the same time, they were able to create a large amount of closet space for their own use. You can see from the gallery images that the amount of storage in this new space is incredible. 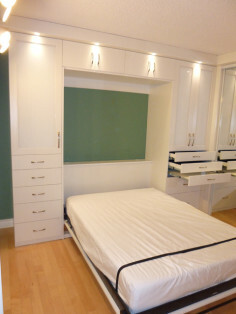 Further, when the doors are closed and the murphy bed tilted up, the clean space can be used for anything, a children’s play area, a yoga studio even a home office. 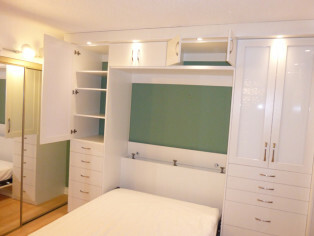 Shaker style cabinet doors with white back painted glass. 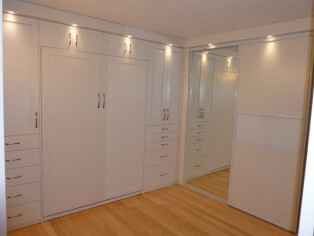 Sliding doors that do not open into the space and allow easier access to the closet behind. Construction of ceiling bulkhead and installation of accent LED lighting. 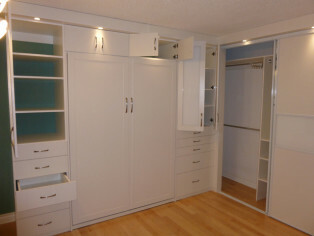 Additional storage behind headboard accessed by a flip-up door. Television hidden behind sliding doors. Pull-out pant rack accessory item. Read this customer’s HomeStars review, posted Jan. 26, 2015. 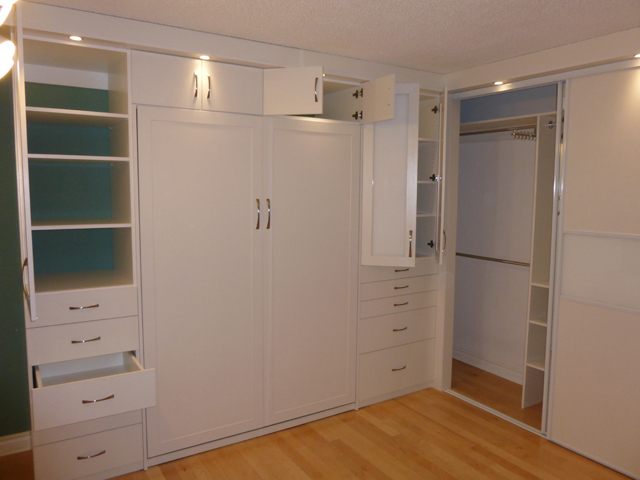 Please Contact Us if you are interested in our Murphy Bed systems or would like more information on other Komandor products.